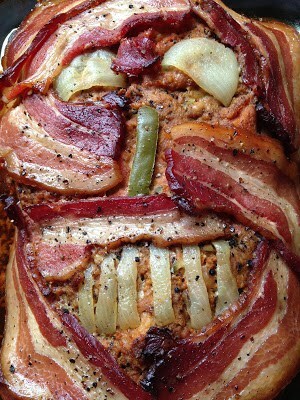 This “Skull Meatloaf “is perfect to serve for a Halloween Dinner. Served with “blood” a.k.a “sweet ketchup sauce” (recipe follows) it becomes a real fright! 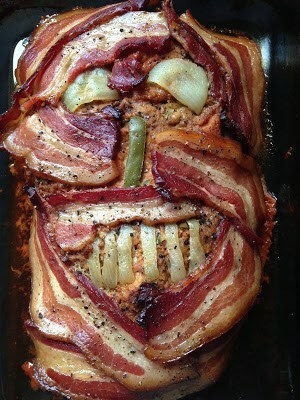 Not only is this meatloaf “scary” it’s scary delicious!! Serve Meatloaf Skull for dinner along with Vampire Dip with Garlic Naan as an appetizer, Mashed Potato Ghosts, Scary Corn and for dessert Tombstones! Adults and kids alike will go crazy for this dinner. Have some family and friends over to go trick or treating. When you get home you can serve this fun and festive Halloween Dinner. This is my go-to meatloaf recipe, that I have made many times before. The only difference is this time I shaped the loaf into a head/skull shape. This recipe makes a large meatloaf skull but you can certainly cut the recipe in half. 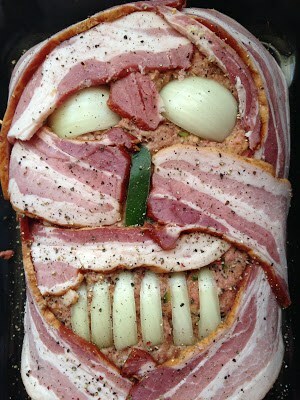 I used onion slices for the eyes and teeth, a green pepper slice for the nose and covered the head/skull with bacon bandages. We baked the skull meatloaf in a 13 x 9-inch baking dish, so I could randomly drain the grease and fat from the baking dish. Serve this meatloaf skull with mashed potato ghosts, creamed corn and tombstones for dessert. Preheat oven to 350º In a large bowl mix together all ingredients. Place mixture into a 13 x 9 inch baking dish and shape into a skull. Place onion slices on meatloaf for eyes and green pepper slices on meatloaf skull for teeth. 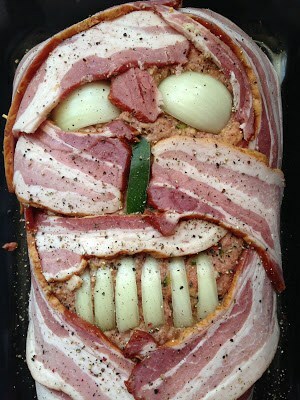 Randomly place bacon slices on meatloaf skull to look like bandages. Meanwhile, in a small saucepan, stir together ketchup, brown sugar, Worcestershire sauce, onion powder and garlic powder. Simmer on low until warm. Pour over meatloaf. Serve.